It's time to get this year started! Tell us what you think in this week's poll. Your browser doesn't support iFrames :( Vote for this poll here. The Office of Off-Campus Living and Commuting Student Services is excited to begin another fantastic school year. The office has many great programs and activities planned for our commuting and off-campus students. As I met with the international students today, I can see the excitement in their eyes and their eagerness to start a new school year. It makes me think of my first day in college, the excitement and the fear of something new. I'm excited to meet commuters and all students at Welcome Week, and I hope that all our new students have an amazing time here at Hofstra! Please visit our webpage for more information. Hofstra करने के लिए आपका स्वागत है! Welkom op de Hofstra! 欢迎光临Hofstra! Not even Hurricane Irene could keep away the close to 200 international students who “blew” in today for the Office of Multicultural and International Student Programs’ new international student orientation. Whether your native language is Hindi or Dutch or Chinese (see above), or one of the other many languages spoken by our new international students who represent approximately 40 different countries, we’re so glad you’re here! We also look forward to the arrival of those international students who were delayed by the weather this weekend; we wish you all safe travels! As you can see from the picture, our students are already beginning to make connections and form friendships. Stay tuned for more international orientation updates as the week progresses. Conversa a você mais tarde! Stay Up To Date This Weekend! Are you living near Hofstra? Will be on campus this weekend? 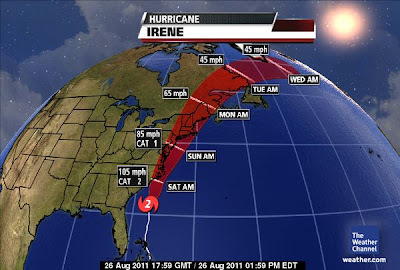 Stay up to date and informed during this weekend's storm. With any news dealing with Hofstra, please refer to this website throughout the weekend. Be sure to stock up on some cookie dough, board games, and a good book this weekend...And try to stay dry! Here's a Sneak Peek from the renovations of Hof USA and Bill of Rights! HOF USA: Below you'll see 2 pictures, taken from the same spot, looking into the area where you'll be ordering your food. Bill Of Rights: Below are 2 pictures from the updated lobby of Bill Of Rights. New Entrance into BOR. Equipped with a turnstile and Sliding Door. Stay tuned for more updates covering all renovations of Hof USA, Dutch Treats, & the Student Center Game Room! Student Counseling has been out meeting our great new crop of Resident Assistants. 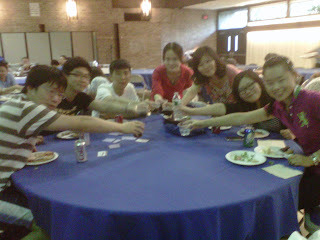 Hofstra’s RA’s are the best! On Tuesday we offered them information about how to help students who are experiencing concerns or are possibly in distress. Your RA’s are a great resource so don’t hesitate to go to them with questions. We are looking forward to meeting incoming students and saying welcome back to our returning Hofstra students. If you have a chance, stop by and say hi to our Student Counseling staff in the Netherlands residence hall where we will be during Welcome Weekend and throughout the first week of classes. In the meantime, check out our Homepage for lots of great information! Visit the Student Affairs blog every Wednesday afternoon for our question of the week! Your browser doesn't support iFrames :( Vote for this poll &amp;amp;amp;amp;amp;amp;amp;amp;amp;amp;amp;lt;a href="http://twtpoll.com/4ky7b6" title="here" target="_blank"&amp;amp;amp;amp;amp;amp;amp;amp;amp;amp;amp;gt;here&amp;amp;amp;amp;amp;amp;amp;amp;amp;amp;amp;lt;/a&amp;amp;amp;amp;amp;amp;amp;amp;amp;amp;amp;gt;. We are very excited to announce updates to our SSD webpage including the addition of our department Mission Statement, resources for students and information about our testing lab in Roosevelt Hall. Please call us if would like to see anything else up there at 516-463-7075. How do I know you ask? I was there, along with twenty orientation leaders, four welcome week coordinators, two graduate assistants, one intern and an entire office as we planned an implemented eight weeks of new student orientation. During the course of eight weeks, we saw 1606 first-year students and hope that orientation provided a peek into what the next four years will look like. Most of the orientation leaders have a brief break before gearing up for Welcome Week (September 1-5) while the Welcome Week Coordinators are currently in overdrive putting the finishing touches on the program. We Got the Spirit! The 2011-2012 Spirit Support Teams are gearing up for an intense year of high-energy performances, new music, new routines, and of course COMPETITIONS! These past two weeks, Hofstra Cheer and Dance worked throughout their pre-camp on team builders and choreographing a competitive routine to take with them to their Spirit Camps in Scranton, PA. It wouldn’t be our Nationally-recognized teams if we didn’t take home some sweet prizes! 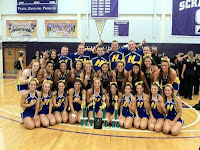 Our Cheer Team made a clean sweep, three years in a row. 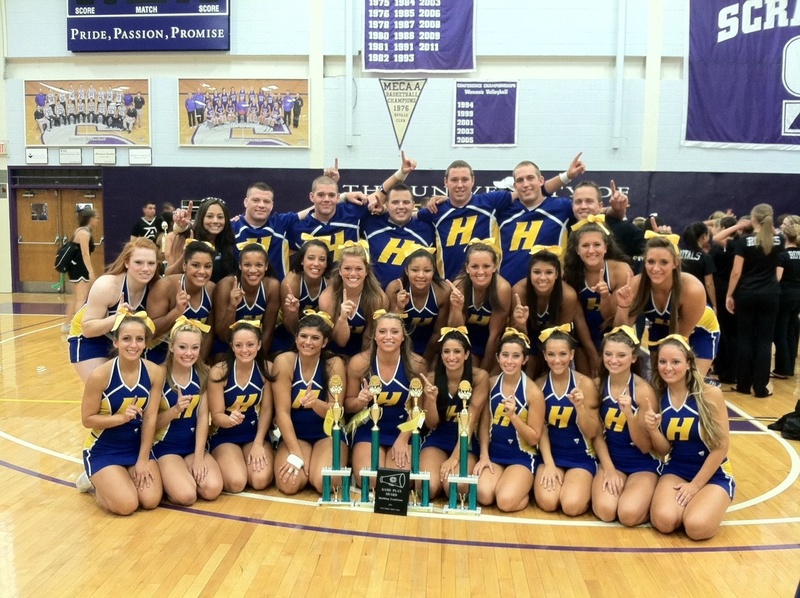 After competing against teams like St. John's, Villanova, and Penn State, our Hofstra University Cheer Team took home first place in the chant competition, the cheer competition, The Game Day Award, and Most Collegiate/Leadership Award. The Dance Team received all blue ribbons (the highest you can get) on the routines they learned while at camp; received a superior trophy, a program improvement trophy, and a Collegiate trophy for representing their University in an extremely positive way. On the home front, the Pep Band is gearing up for an intense one-day Orientation program that will consist of blood, sweat and tears! Well, just kidding on the blood, but they will be participating in an intense team-building experience on campus followed by their first rehearsal featuring all new music for Fall Festival (September 23-25)! Keep your eyes and ears open because you’re in for a real treat come September 24th! Go PRIDE! The Center for University Advisement at Hofstra would like to welcome all the new students to campus, and welcome back all of our continuing students! We’re looking forward to being here for you every step along your journey toward graduation. We have been busy all summer (along with the rest of Student Affairs) preparing new first year and transfer students for the year ahead, and now the new year is upon us - we hope you are as excited as we are! Did you know that every student at Hofstra has their own, personal advisement dean? In addition to your major adviser (once you have declared your major), you have been assigned to one of us to help you with planning and decision making, troubleshooting problems, finding answers, and learning how to navigate. Plan on meeting with us along the way to make sure you stay on course and avoid costly mistakes. Make sure you meet with your adviser at least once each semester before registration – but we would love to see you more often! Find your advisement dean by calling one of the numbers below, or look on your Hofstra portal under Student Records -> View Student Information. Don’t forget to check your Hofstra email frequently, read your portal announcements, and stay in touch – we’re here for you! #1 College Relay for Life on Long Island! One of Hofstra’s largest events every spring is our annual on-campus Relay for Life fundraiser for the American Cancer Society. For those that don’t know, Relay for Life is an all-night fund raising walk held on the intramural fields to not only raise money for a great cause but to also celebrate the triumphs of those who have survived cancer, acknowledge their caretakers, and remember the lives of those who have passed. This year’s Relay proved to be the biggest and best yet with 1,000 student participants raising over $90,000! This was made possible by the hard work and dedication of many students who worked closely with the American Cancer Society and the Student Leadership and Activities Office. It also helps when an anonymous donor makes a $10,000 donation the day of the event! I would especially like to give a virtual high-five to Katie Friedman, Tyler GreenPope, and Zach Dane for all their hard work as the three chairs of this year’s Relay for Life Student Committee. So why am I bringing this all up? Because last Thursday various representatives from Hofstra were invited to the Relay for Life All-Star Party held at the NYIT de Seversky Mansion and I was lucky enough to be one of them. 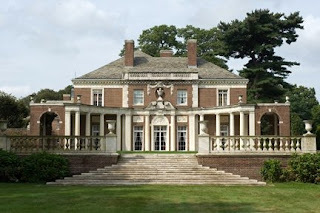 The mansion was beautiful and I felt as if I was in the 19th century and should be wearing a ball gown! It was a touching evening as the American Cancer Society thanked their top fundraisers for all their hard work at their respective Relays. We knew that Hofstra was 5th out of 62 college Relays in the entire eastern division, but it wasn’t until now that we knew we were the “#1 College Relay for Life on Long Island” in 2011! 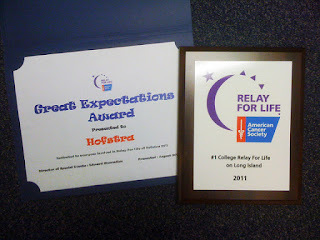 They also gave out a few superlative awards and Hofstra won the “Great Expectations Award” for our generous anonymous donor who was so unexpected! So if you are reading this right now anonymous donor, please let us know so you can come get your award! After the All-Star Party I feel more motivated than ever to make this year’s Relay for Life even BIGGER and BETTER! So make sure you join us this spring on Saturday, April 28, 2012 for a great cause and an a ton of fun! Yesterday was our annual summer meeting for the entire Division of Student Affairs, which is our staff’s kick-off to the fall term. About 120 people from across Student Affairs spent the morning committed to stepping away from their to do lists, e-mail, and projects to focus on the WHY behind what we do. We talked about how we can contribute to student engagement, create an inclusive environment, build community, and support students so they can be well and succeed. We thought about how to stay connected to our mission day by day, improving our own skills and knowledge so we can be better professionals for our students. And we pushed ourselves to be more creative with technology and our resources when meeting student needs. So come on, students—come on back! We’re refreshed and ready for another year, and we hope you are, too. HOLY COW!!!! I cannot believe it is the middle of August already! It seems like the class of 2011 just graduated yesterday. Its hard to imagine that in just a few short weeks we will be back in full swing of the fall semester. 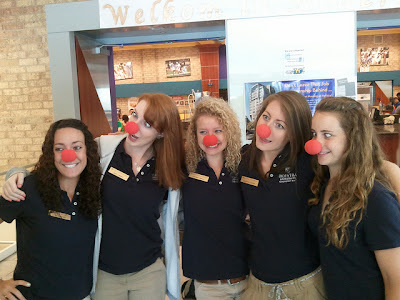 Residential Programs has been hard at work all summer planning a fun-filled fall semester for all of you. We had a number of updates and renovations take place within the residence halls. Bill of Rights and Enterprise Halls received new windows and blinds, new paint, carpeting and HVAC units and all common spaces and bedrooms received new furniture. New entrance ways and lobby areas were constructed in both buildings as well. All bedrooms throughout Suffolk Hall received new bedroom furniture. Finally, most buildings in Colonial Square were painted. As you can see our Residential Operations crew has been hard at work in anticipation of your arrival in September! Throughout the month of August our entire Residential Programs staff is in training. We are in the midst of Senior Resident Assistant Training this week. This is a group of dynamic student leaders that are available to assist you in any way possible. As a group they are involved throughout campus in a variety of different student clubs and organizations and I'm sure they would LOVE to share all of their knowledge and experiences at Hofstra with you! We will continue to prepare and plan for your arrival this fall and are looking forward to another exciting year filled with fun, excitement and new opportunities! Hofstra Orientation: Not Just for Students! Hello There, Sunshine! This is a photograph of this summer's Parent Orientation team. You might be thinking, I've never seen these people in my life… nice polos, dorks! For our new incoming students: if your parent(s) and/or family members attended this summer's Parent Orientation while you were at your Orientation then they met us and probably asked us questions that you most certainly would be embarrassed about! No, Hofstra Dad, there isn’t a curfew. We saw over 1,400 of your eagerly excited, nervous, EMO, and proud parents and relatives. Similar to the spectrum of emotions you’re experiencing during these last few weeks of summer, parents and your guardians also need a little help transitioning to having their children grow up and enter college. That’s when the Office of Parent and Family Programs comes to your rescue and helps your parents realize that there’s no need to worry, everything will be okay, and to R-E-L-A-X. During Parent Orientation, we tell them about the intellectually stimulating courses you will succeed in, the clubs and sport teams you’ll join (they were very excited to hear about Hofstra Quidditch: I got 99 problems, but a snitch ain’t one! HOLLAH, HARRY! ), the support our Student Affairs team and faculty provide, safety on campus, and that college is not the 13th grade! I answered mystifying questions from decorating tips, rug sizes, where the nearest Pier 1 is to shuttle services, internship opportunities, what type of laptop to buy you, and whether the food on campus is good to which I say, “It’s good, but nothing beats Mom’s chicken cutlets.” Moms always smile after that. Essentially, Parent Orientation lets your folks know that Hofstra is a strong collegiate community and that there’s no better place for you to be at this time in your life. The reason for Parent Orientation is that we know how much they love you, wanting nothing but the best future for you and we want to let them know that the pride that they feel in their hearts now, knowing you’re going to a great school, will continue to grow multitudes throughout your academic career. My piece of summer advice to our incoming students is simple: Always be gracious and remind yourself to thank your families frequently. They helped you get to this monumental time in your life called college. They will also help you get through it and become the young women and men you’re destined to be. Always be proud of where you have come from and where you are going. P.S. Need help talking to your parents or want to know about ways they can get involved at Hofstra? Give me a call at 516-463-4698. As the end of summer slowly approaches, the SSD testing lab wants you to see what we have been working on as a result of your survey suggestions. Say goodbye those old, uncomfortable chairs at the testing tables and welcome the new, cushioned blue additions! Also, if you have ever spent long hours in the lab taking an exam, I'm sure you will enjoy the new water cooler! You spoke, we listened! Come September, come and enjoy the improved SSD testing lab! A question I commonly receive from students, or acquaintances who don’t work in my field, is about what we college administrators do all summer long when the majority of students are gone: “It must be quiet, right? Do you get the summer off?” True, the student foot traffic is a lot lighter than during the school year, and there are much fewer events to attend. 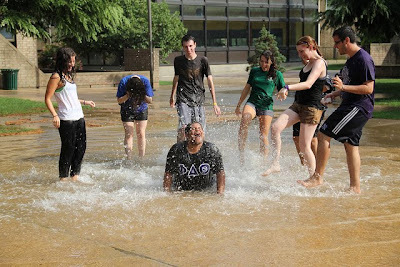 But, believe it or not, we in the Division of Student Affairs stay extremely busy all summer long. First, there is New Student and Parent Orientation, both of which take place for eight weeks throughout the summer. There are student staff (e.g., Orientation Leaders, Resident Assistants) to train, and sometimes new professional staff to hire. Typically, we’ll use the summer to conduct staff retreats to connect our teams together and develop our goals for the upcoming school year. There are websites and publications to update; housing applications to process and residence halls to refurbish; reports to write and budgets to finalize; and many, many events to plan! Some big events on the horizon include Welcome Week and the Hofstra Fall Festival. We also work with Admissions in securing our new class of students. For example, we assist with the Admissions Enrollment Days, and the Divisional staff calls every single student within the incoming class to welcome them to Hofstra. Despite our hectic schedules, we still manage to fit in some fun. Just about everyone takes a week or two of vacation during the summer (I went to Cancun, Atlanta, and Fire Island! 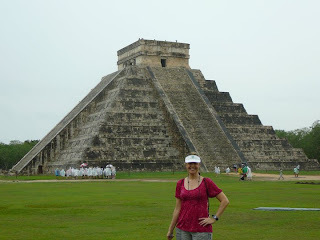 See my picture taken in Chichen Itza, Cancun, Mexico). Often, we’ll have Divisional socials to connect as a staff and celebrate our accomplishments of the past year. We also engage in a friendly softball rivalry with some of the other departments on campus (next week we’ll be taking on Enrollment Services). We do enjoy the fact that it’s much easier to find a parking spot during the summer. But ultimately, (around this time of year, especially) we miss our students and long for your return. A little bit of quiet is nice for a while, but we enjoy the vibrancy that you all bring to campus. I look forward to seeing you all very soon! Let's Kick This off with an Announcement!